My Little One has been putting the Yummy Nummies products to the test over the years and has always loved them. 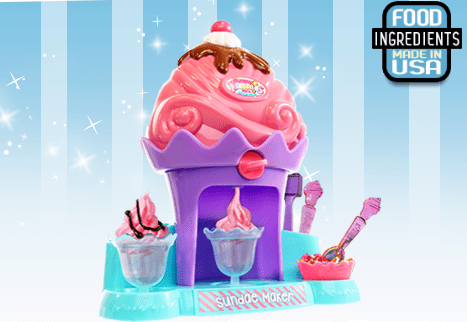 The latest Yummy Nummies product that she has tested out is the Sundae Maker Playset. Delicious strawberry ice cream flavored treats. Decorate with fudge and sprinkles! No freezing required. Makes 8 mini sundaes. Includes 1 playset, 1 kitchen magic tray, 1 instruction sheet, 2 strawberry ice cream flavor packets, 1 fudge glaze packet, 1 sprinkles packet, 2 spoons, 1 measuring scoop, 1 dropper, 1 mixing bowl, and 2 sundae dishes. Disposable cooking utensils for easy cleanup. My Little One had a great time making the sundaes. The only problem she found was that the only flavor of ice cream that the set comes with is strawberry and she does not like strawberry ice cream. 🙁 So my Little One’s recommendation would be to have chocolate or vanilla as one of the flavors of ice cream in the kit. Otherwise, my Little One thinks that the sprinkles and the fudge were great. 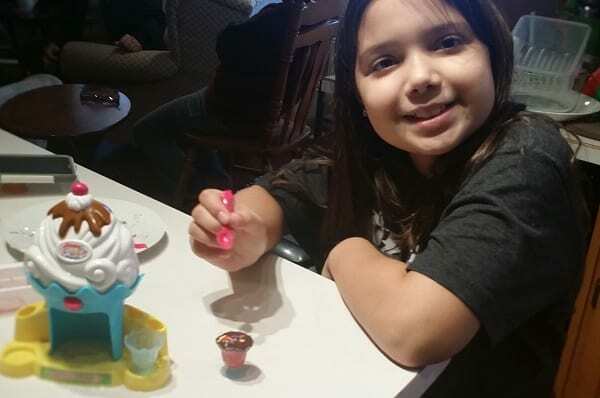 Making the sundaes was fun for her and she likes to make them for anyone that is willing to be her sundae taste tester. The playset is something that kids can use on their own, including instructions with pictures. I recommend with this playset that an adult cleans the unit. There are quite a few corners and cracks that fudge really gets in, and it really needs a good soaking and cleaning to ensure that all the nooks and crannies get thoroughly clean. The wonderful thing about the entire line of Yummy Nummies products, is that the little chef in your house can create all on their own, with all the ingredients in the package, and easy to follow instructions. So parents don’t always have to be right there creating along with the little chef. If your kids are anything like my Little One, then they really like the independence of creating a delicious creation on their own. It makes them feel great to have created a great looking and good tasting dish and the Yummy Nummies’ products give them the freedom to do just that. We have always loved Yummy Nummies and all their products. My Little One and I both recommend that you check out all the items available from Yummy Nummies for your little chef in the house. To find out more about Yummy Nummies, make sure to check them out here….